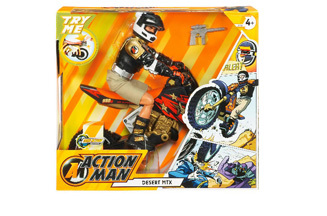 LONDON - Action Man makes a return to toy shelves today after a three-year absence dressed not in military uniforms but as more modern heroes such as extreme-sports participants. Tesco is stocking thousands of the Action Man figures that despite having apparently been discharged from the armed forces continue to come armed with a range of weapons. The range, which starts at £5, includes a scuba patrol and a desert moto-cross bike rider. Action Man first appeared in Britain in 1966. Earlier this year the Ministry of Defence licenced a range of authentic HM Armed Forces action figures.